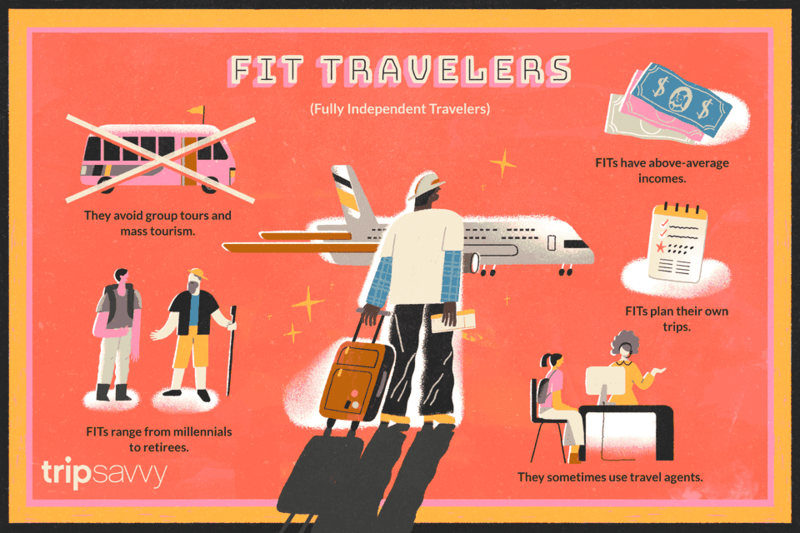 Originally, the acronym "FIT" stood for "foreign independent tour," but now it is most commonly used to describe a fully independent traveler or tourist. You might also see the term "FIT" used to mean "free independent traveler," "frequent independent traveler," or "foreign independent traveler." All of these definitions share a keyword and concept: independent. These travelers almost always design their own itineraries and arrange their own travel plans—FITs do not travel with group tours or according to any schedule imposed by others. Tourists who fit the definition of FITs usually travel solo; in couples; or in small, intimate groups of friends or family. They range anywhere in age from millennials to retirees, but generally, they have above-average incomes that allow for independent travel, which can be more expensive than traveling with an organized group. But what all FITs share, by definition, is a desire to avoid mass tourism in favor of an individualized, independent approach. They tend to want to explore their chosen destinations on their own and at their own pace with an emphasis on enjoying the local food, architecture, history, and culture. The huge rise in availability of all aspects of travel planning online, including even websites devoted to helping you learn how to plan travel, has made it easier for independent travelers to plan their own specialized itineraries and book their own transportation and accommodations. This diminishes their need for traditional travel agents, and this also makes packaged trips have less appeal. As a result, FITs are a quickly growing segment of the tourist market. First-hand travel information about destinations, transportation arrangements such as train and ​plane tickets, and hotel reservations worldwide are available at the click of a mouse for independent travelers. Although the "I" in FITs means independent, it sometimes could be advantageous to consult with travel professionals who are experienced in providing services to those who want to plan their own trips, especially for more exotic destinations. Doing so does not necessarily mean that independent tourists have to relinquish their, well, independence. As a result of the rise in popularity of independent and solo travel, travel professionals are adjusting their services accordingly. There are now agencies that specialize in customized trips for individuals and small groups who want to choose their destinations and plan their own itineraries. The traveling is still independent, but the planning benefits from professional expertise and inside knowledge. And of course, it takes much less time than searching for all the information you need on your own. An agent who specializes in FIT travel can help you plan custom sightseeing with a private tour guide, arrange a private cooking class or a wine-tasting tour, and even hook you up with knowledgeable local representatives. The agent will help you plan a personalized travel experience based on the input you provide. If you wish, an agent can often arrange to have someone meet you at your destination and take you to your hotel. Travel professionals are especially helpful in finding non-traditional or out-of-the-way accommodations that do not advertise on the internet, such as villas, farmhouses, inns, and family-run ​bed-and-breakfasts.